So one may think life in the jungle tropics and a major tourist spot is all about party and that next margarita hopefully minus the cruda(hangover). Reality of full time life is the same more or less anywhere. Here is mine more or less during the school year. Shake myself up at 6:15am to rise the boy and do mom duties, breakfast, lunch feed the dog…., rush out the front door and take him to school and get an hour of Crossfit in, yes push myself and see how much or little I can do hahahahah. Then I’m so called free until 2:30. What’s a mom to do… freedom not, son thinks it’s free time!!! Grocery shopping, cook prepping, laundry, paperwork,… wait I can do that anywhere don’t need to be here! But the other stuff that’s different is making sure the gas tank is filled, last week the pipa ( truck) never came for 3 days um yeah right it broke down and supposedly that and only that one serves my area hahahaha, different company after the holiday arrived promptly took 4 days and a gazillion of calls! Dealing with banks teeth grinding with all my pertinent papers and 500 copies in tow!! Oh and the sketchy internet and phone yes in a major city omg one needs nerves of steel. But the worst is CFE the monopoly of power company, new algorithms new system and the rates go from 1800 pesos a month to 12000 holy moly the jefes there hate this gringa!!!! 6 months later and still not resolved. So there are alot of crazies, if I have time I do this in my free time sew and bake. I sew a lot almost daily, I make clothes and bags and love to do pattern testing as it pushes me to try new things. I’m lucky we have a pool so when it gets hot I jump in to cool off as I dont like to pay for air conditioning. After I get my son he practices violin, does homework, has soccer or tennis. 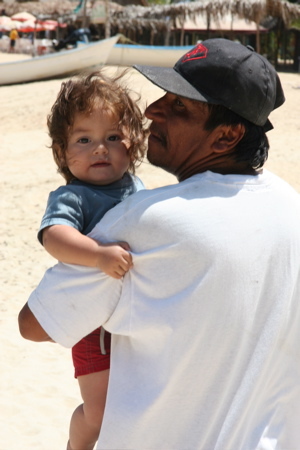 We used to live in Yelapa a remote pueblo in Jalisco. 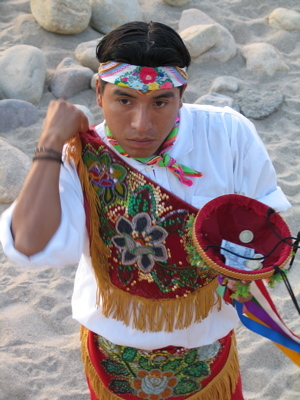 Yelapa is a comunidad indígena -Comunidad Indígena de Chacala in Cabo Corrientes. 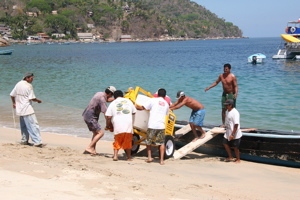 We still have many ties to Yelapa as my son is from there and many family live there. 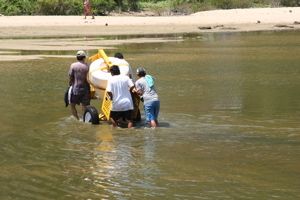 It is difficult to get there by car, think 4 hours from Vallarta on a dirt switchback road, so most people go in a water taxi. 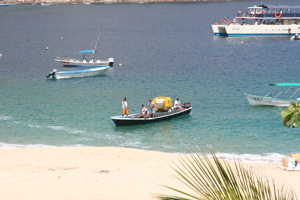 This is Boca de Tomatlan one of 2 places to get the water taxi. We have arrived and yes it’s magical. Then it’s time to go back and everyone want to stay but normal life is tomorrow. Next up our normal lives!!! Jungle living at its best. I’ve been living in the jungle off and on for over 25 years in Puerto Vallarta or Yelapa a remote Pueblo that is mainly reached by panga. 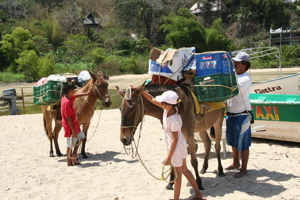 Living in Yelapa has its beauty and of course challenges!!! The beauty is immense, no cars well now lots of ATV’s that drive cra cra,, the ocean, the small rural community, every one knows each other, waterfalls, hikes… and frustrations of having lo schlepp most of your stuff on the water taxis, no banks, expensive to build, electricity arrived early 2000’s, water is still an issue as is septic, internet is now slowly getting there and well and the indigenous community it is has issues too. But a magical place. 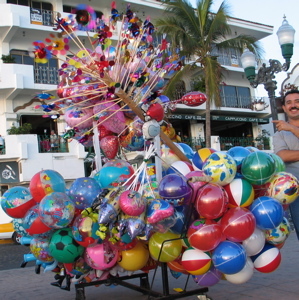 I am currently living in Vallarta the closest city. one of the downsides of construction there are alot of details that one of us has to do in vallarta, so i thought this mornign i wouldnt return until next week when i arrived in yelapa, but i was mistaken, i needed to turn around 3 hours later and run an errand… so here i am again! 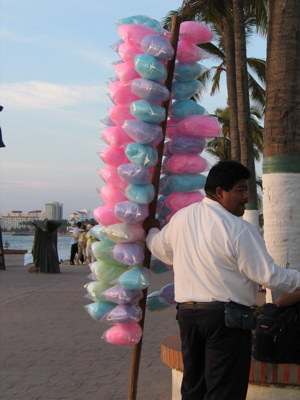 sebastian and i took a walk down to the malecon to see the sights. its nice this time of year and not too many people there. 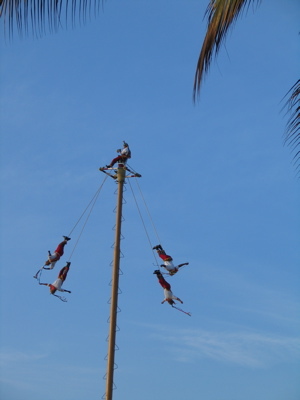 this a ceremonial event that the Voladores de Papantla do(a good explanation here, http://www.xcaret.com/park-attractions/flying-men.php ) do. 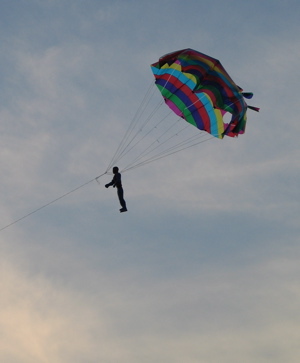 they are high on a port and one man is chanting and singing and doing a blessing on top and the 4 men lower themselves head first swinging around. it is beautiful. 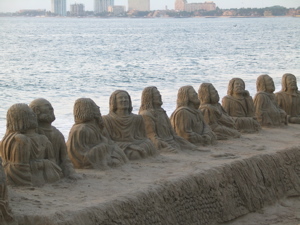 sand sculptures that change all the time! 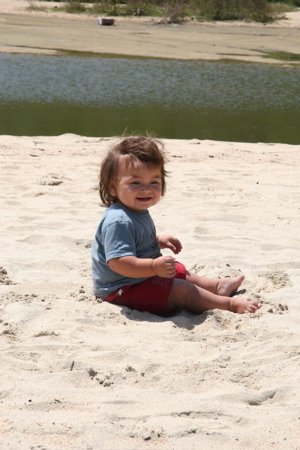 sebastian loves watching the parasailing every day so when he saw a toy one he became very excited. 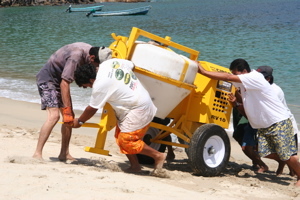 almost all of the cement is hand mixed here… to save time we modernized somewhat! 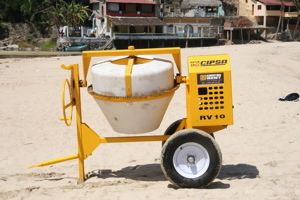 a new cement mixer with a honda 8hp motor! now how does that arrive? usually by truck, but here by panga on top of another load of rebar. always an event. yelapa we have arrived! tourists also in the background! chaparrito waiting for dad and becoming impatient! throught the lagoon to the job site! al fin my dad is mine!